When individuals are interested in purchasing, investing or working with a company it may also be a good idea to assess it’s financial status, using public information available through government sources, two documents can allow proper assessment. A statement of comprehensive income and a statement of financial position. A statement of comprehensive income is a usually detailed report listing the inflows and outflows of capital of a business. They often include exceptional expenses and net profit for a business and subsequently can be difficult to follow but should provide a good understanding on how a business functions through the financial year. A statement of financial position outlines the inventories, assets and equity a business has at the end of a year or season. It may also help to identify where most of a businesses cash is being spent or held in assets. What are the benefits of these documents? A statement of comprehensive income will help to identify the basic operations of a business, for example the yearly turnover. 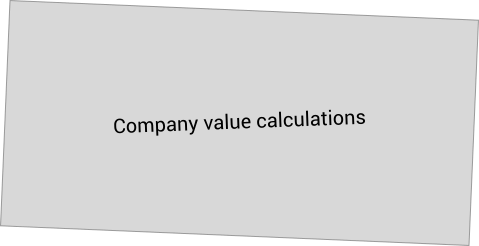 A company that makes more turnover than another, however may not be financially better or worse however as it can depend on how the money is used, fortunately there are many equations that can help us to define a standard for these figures that we can use to compare between businesses or yearly statistics. Gross profits allow us to determine how much profit a company makes after selling it’s products, this is already better than revenue as it shows that a company may be making a lot of revenue, but may be spending it all on sales. It is usually defined in the statement of comprehensive income. Gross profit is Sales Revenue – Cost of Sales. This figure is useful, but can be more effective when coupled with a percentage, as it is would allow us to compare for example previous years income, as below, it is for this reason we use the Gross Profit Margin to calculate a percentage. Gross Profit Margin is (Sales Revenue – Cost of Sales) ÷ Sales Revenue. Higher is better. As you can see from above the company XYZ Telecoms makes more money than AB Telecom however it is much more inefficient in it’s spending and therefore could reduce the cost of it’s sales to get higher returns. Note that although AB Telecom makes a higher Gross Profit Margin it does not make more money. Here is a breakdown of another Telecom company Telecomatic and they spend roughly 40% of their Revenue on sales, and therefore have a gross profit margin of 60%. In other words, if 40% is spent on sales, the company keeps the other 60% barring any other costs, like fixed costs. Enables you to calculate if spending on sales is too great. Identify which company is better at sales spending. Enables to identify if year on year a businesses spending on sales has been successful or not. If there are two company chains, in two different locations with similar sales revenue, if they were to use different methods of advertising the sales profit margin would allow you to determine the best method based on the higher percentage. Account for exceptional items or income. Account for Fixed costs, such as machinery rent or leasing. Exceptional expenses, like purchasing new facilities or machinery. Assets a business may hold of value. Financial income or company dividend. Operating Profit is calculated by Gross Profit – Overheads. Operating Profit Margin is calculated by (Operating Profit) ÷ Sales Revenue. Lastly, for the comprehensive income sheet, the Net Profit Margin will show the overall effectiveness of the businesses expenditure. And represents how much raw profit a company makes based off its revenue, to put this into perspective its how much money is profit when multiplied by the turnover, so if a company’s net profit margin is 17%, and they turnover $1m a year, the company will have $170,000 unconditional capital left over at the end of the year barring complications. The Net Profit Margin is calculated by Profit for the year ÷ Sales Revenue.